A bronze group of a camel and a rider found in Cameiros in Rhodes (Greece) is thought to be of eastern origin (Boardman 1980, 69). The archaeological context in which it was found can mostly be dated to the first half of the 7th century BCE (Börker-Klähn 1973, 54). Its exact origin however is disputed. Börker-Klähn (1973) and Braun-Holzinger (1984) believe that it may be Late Assyrian, while Moorey attributes it to a Syrian metal workshop of the 8th or 7th century BCE (1984). Curtis (1994) suggests that this group might also be North Syrian. Depictions of camels and riders can be found in the reliefs of Ashurbanipal from Room L of the North Palace at Nineveh, where there are two riders on a camel, as well as on the reliefs of Tiglath-Pileser III. 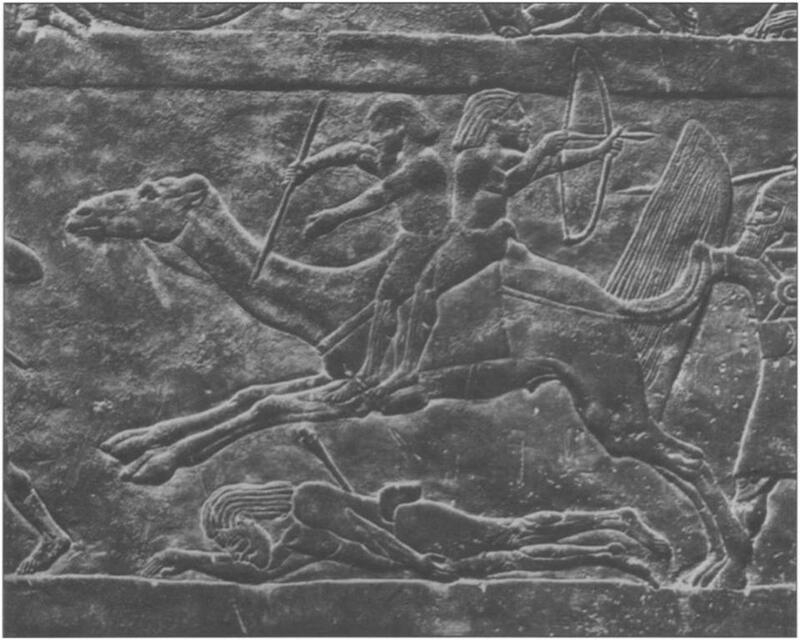 Moreover, a camel and rider is depicted on a red-painted limestone low relief from Tell Halaf in Syria dated to ca. 1000 BC. Moorey 1984, no. 127a Moorey, P. R. S. (plates). In: John Boardman (ed.). The Cambridge Ancient History. Plates to Vol. III: The Middle East, the Greek World and the Balkans to the sixth century B.C. Cambridge: Cambridge University Press 1984, (second edition). Fig. 1: Bronze group of camel and rider from Kameiros, Rhodes (BM WA 135845). Photos courtesy of the Trustees of the British Museum (taken from Curtis 1994). Fig. 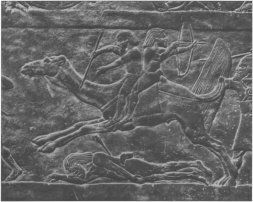 2: Detail of the relief of Ashurbanipal from Room L of the North Palace at Nineveh, depicting Assyrian troops pursuing Arabs on camels. Photo courtesy of the Trustees of the British Museum (taken from Curtis 1994). Fig. 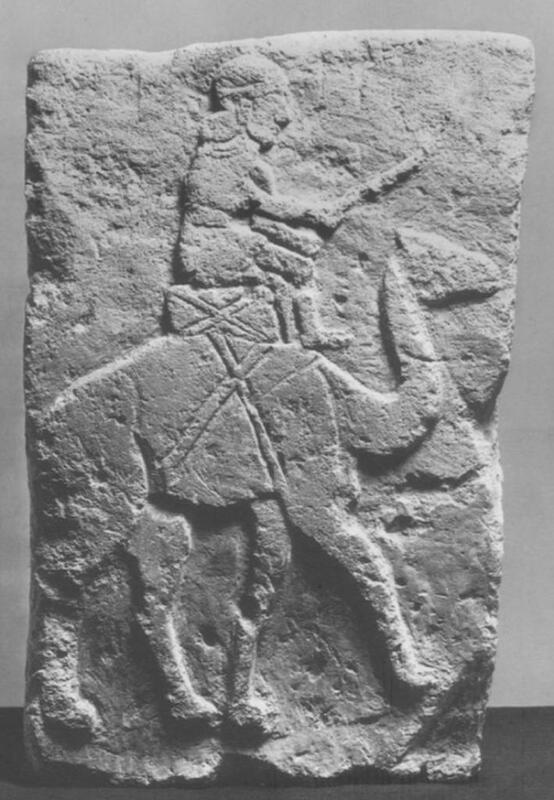 3: Red-painted limestone low relief from Tell Halaf, Syria, depicting a rider driving a camel with a rod from his perch atop a box-like saddle, dated to ca. 1000 BCE. Walten Art Gallery, Baltimore (taken from Köhler-Rollefson 1993).